Nanoscience is a rapidly growing multidisciplinary subject area which has gained a great deal of attention in many fields including biomedical, engineering, industrial, agricultural, environmental, energy and value-addition to natural resources. Nanotechnology is a rapidly growing technology derived from nanoscience when it comes to practical applications scenario. The nanotechnology deals with materials at 1-100 nm size range and at this range, properties of materials show significant differences compared to large sizes of the same material. Therefore there is a huge knowledge gap to be filled in nanoscience and nanotechnology. As a result, scientists are engaged in an enormous amount of research and development activities in a broad range of research areas of nanoscience and nanotechnology. Therefore The International Institute of Knowledge Management (TIIKM) organized International Conference on Nanoscience and Nanotechnology (ICNSNT) since 2014 in order to provide an important platform for international researchers and technologists to communicate their valuable results and outcomes of researches. 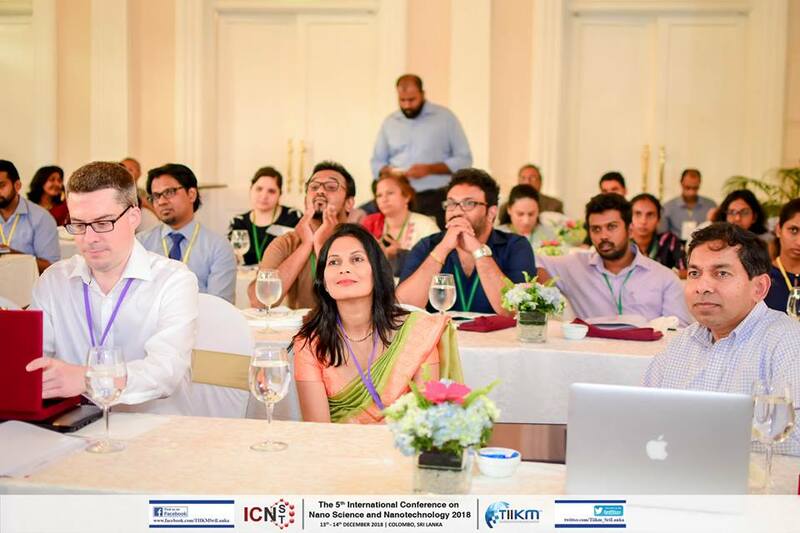 In 2018 TIIKM successfully organized the conference for the fifth time at hotel Taj Samudra, Colombo on 13-14th December 2018. The hosting partner of the conference was International Islamic University, Malaysia. The most interesting and educational keynote speeches were delivered by Prof. Nilanga Liyanage at University of Virginia, USA, Prof. G. R. A. Kumara at National Institute of Fundamental Studies, Sri Lanka and Dr. Gareth Williams at the University College London, UK. Conference photograph was taken after the keynote session. The plenary speech after the first two technical sessions were conducted by Prof. Rohini M de Silva at the University of Colombo, Sri Lanka. Details on these key speeches are given in the next sections of the report. The conference was comprised of seven technical sessions full of oral presentations of about 31 abstracts under topics as given below and a poster session with 3 poster presentations. The interesting feature of the conference was the workshop conducted by Dr. Gareth Williams on pharmaceutical-based research and development. This workshop supported young upcoming scientists in Sri Lanka and international scientists working on pharmaceutical-based research activities. The workshop also provided valuable knowledge for scientists new to this area. At the end of the conference, the best presenters were awarded which is very important in encouraging young scientists to continue their good work in the development of nanoscience and nanotechnology. Closure of the 5th international conference on nanoscience and nanotechnology was marked with closing remarks by the conference chair Prof. K. M. Nalin de Silva, Senior professor at University of Colombo and Science Team Leader at Sri Lanka Institute of Nanotechnology, Sri Lanka on 14th December 2018. The best performers of the conference were awarded at the closing ceremony of the conference. Also, session chairs and evaluators were appreciated by awarding tokens of appreciations. Find the full Conference Report through below link, written by Dr. M. M. M. G. Prasanga Gayanath Mantilaka (Rapporteur), Sri Lanka Institute of Nanotechnology, Mahenwatte, Pitipana, Homagama, Sri Lanka.